October is go pink month. So I thought a tasty treat would be appropriate. 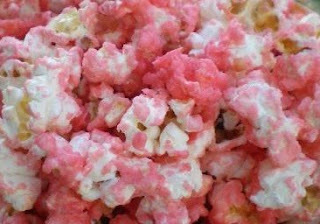 What better than a delicious surprise of pink popcorn treat. Oh so yummy. Cook until slightly firm ball (230 on a candy thermometer) Stirring frequently. Pour slowly over 6 quarts of popped corn. (I use 3/4 c. unpopped kernels for this recipe) Pour out on wax paper to cool. *Recipe does not make popcorn balls. Kernels cluster when poured on.